The Grand Place or Grote Markt is the central square of Brussels. It is surrounded by guildhalls, the city's Town Hall, and the Breadhouse. The square is the most important tourist destination and most memorable landmark in Brussels. It measures 68 by 110 metres (223 by 360 ft), and it is a UNESCO World Heritage Site. 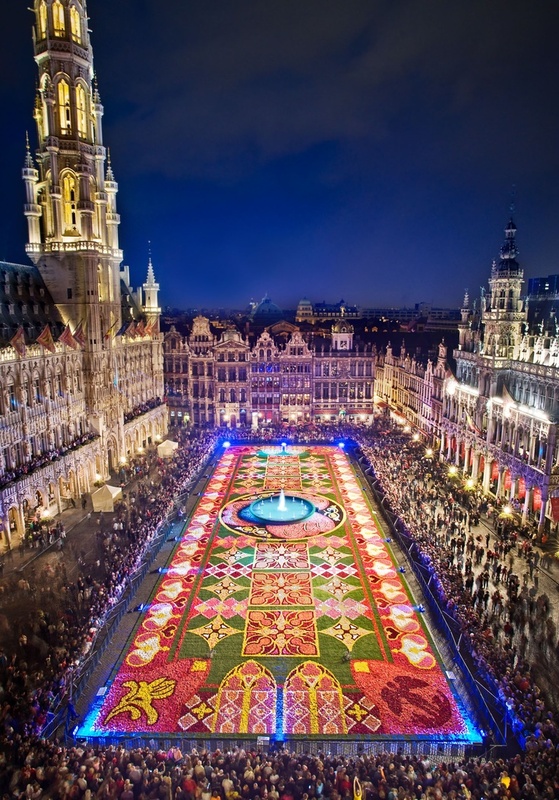 Every two years in August, an enormous "flower carpet" is set up in the Grand Place for a few days. A million colourful begonias are set up in patterns, and the display covers a full 24 by 77 metres (79 by 253 ft), for area total of 1,800 square metres (19,000 sq ft). The first flower carpet was made in 1971, and due to its popularity, the tradition continued, with the flower carpet attracting a large number of tourists.